The view from the top of St. Peter’s Basilica after a challenging climb. Like hordes before us, we entered Rome through its northern gate. We had rented a terrace apartment in an old marble-filled building in the Flaminio neighborhood, just outside the ancient city walls. Each day, we kept pace with Romans bustling to work and flowed through the Porta del Popolo, built in the late 1400s as a grand entrance to the city. Centuries before we arrived, barbarian tribes (so named by the Romans), stormed in and sacked the city. Martin Luther also traveled this way. He came in the early 1500s to live in a monastery, from which he observed the church and the pope close up, just nine years before he and his ideas rocked the world. Later, there was Queen Christina of Sweden, who in 1654 converted to Catholicism, abdicated her throne, and rolled into her adopted city through Porta del Popolo dressed as an Amazon and riding in a chariot. The Porta del Popolo in Rome. Unlike the Visigoths and the Gauls, and unlike the queen, my family and a friend came in peace and attempted to blend in with the Romans. And though Luther might not have liked what he saw, we did. The first morning, in a haze of jet lag, we paused to get our bearings after passing under the arch. To our left, a ragged woman hoping for alms sat on the steps of Santa Maria del Popolo. Inside the church, works by Caravaggio, Raphael, and Bernini belied the simple facade, its travertine dirtied by soot. With 10 days stretching before us, I figured the artwork could wait. In front of us, the vast expanse of Piazza del Popolo made a warm welcome. Sun bounced off its cobblestones. In its corners, sculptures representing the four seasons gazed at indifferent passersby. An obelisk pilfered from ancient Egypt in the early days of the Roman Empire soared. On stairs at its base, young people smoked cigarettes and worked their smartphones. A pair of matching churches, one behind scaffolding, marked the far side of the square. Radiating out from them, three main roads led more deeply into Rome. Which to take? We opted for the center road and passed a restaurant called Dal Bolognese, after a city in Italy renowned for its cuisine; storefronts of Italian designers such as a.testoni and Boggi; and leather goods stores. Clearly, we had chosen well. We wound through a maze of tight streets where shopkeepers chatted with neighbors as they opened for business. A truck loaded with topiaries and bright flowers tooted its horn, nudging its way among pedestrians. Then we landed at our breakfast spot, a cafe that predates the United States. At Antico Caffe Greco, circa 1760, we sat on red-velvet banquettes set against art-covered walls. Officious servers in crisp black suits brought us pastries, cappuccinos, and a hot chocolate nearly as thick as pudding. When we stepped back outside, we practically stumbled onto the Spanish Steps. Just down the street, that staircase rose from Piazza di Spagna, surprisingly empty for one of the city's top attractions. Such unexpected discoveries would occur again and again. Rome is strikingly compact — even as its hold on us looms large. Within its ancient walls, just 12 miles around, lie many of the city's gems: the Colosseum, the Pantheon, the Trevi Fountain. We walked nearly everywhere, moving among epochs in a matter of minutes. We shot past the 28 B.C.E. tomb of Augustus on our way to the Baroque Piazza Navona, all the while navigating the bustle of modern-day Rome. It could be said that I walked amid ancient Rome twice — or at least its marble. The first time was when I toured the Colosseum and Roman Forum. 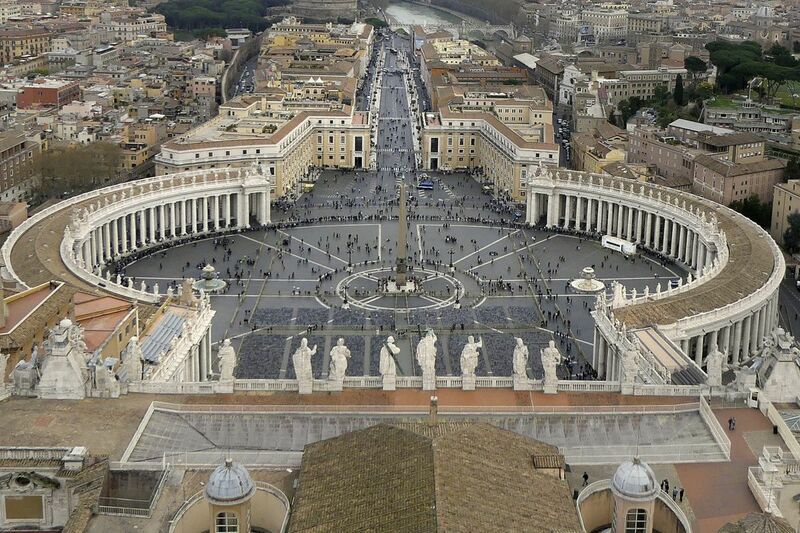 The second was when I explored Vatican City. The Forum is a romantic puzzle of tumbled buildings and suggestive columns, though it was once a gleaming plaza paved with marble and lined with marble temples and buildings. After the fall of the Western Roman Empire in the fifth century, Romans turned away from the Forum, cows grazed the grounds, and some of the marble was hauled away to be used for the next big thing: St. Peter's Basilica. "The Romans were great recyclers," said our tour guide, who painted vivid pictures of the Colosseum, the Roman Forum, and the Palatine Hill, where the ruling class of the empire had lived. "The place had been abandoned, so it was like picking through a junk pile." What a spectacular junk pile, with remnants of temples that still reach to the sky, weathered marble blocks, and a majestic symmetry that remains amid the ruins. During an afternoon, we learned how early Romans managed to construct the Colosseum, the largest amphitheater ever built, beginning in A.D. 70. Turns out that concrete made of Roman soil has an especially strong quality. It helps, too, that those ancient innovators bored holes through each piece of a column, lined them up, and then poured molten metal inside. By chance, we toured the site on March 15, the Ides of March and the anniversary of the 44 B.C.E. assassination of Julius Caesar — a death that presaged the transition from the Roman Republic to the Empire. More than 2,000 years later, people were still paying their respects. Some wore wreath crowns in his honor. Flowers piled up where his body had lain. I wasn't so moved by Caesar, but a few mornings later, Michelangelo demanded my devotion. We had risen early and gathered with a small group for an early-morning tour of the Vatican. Our guide handed us earpieces and marched us to a line outside the Vatican Museums. Hundreds of people waited with us, a mere fraction of the number that would descend when the museums opened to the public. Once inside, she sped the group to the Sistine Chapel, where we could marvel in relative peace at the crowning work by Michelangelo. It was glorious. How could a man so cranky (he didn't want the job) and uncomfortable (he refused to lie on scaffolding, as most ceiling painters did) and who had previously worked only as a sculptor (the pope insisted he paint) create such beauty? Well, it is a holy space. Most days, we roamed the city. One day, we rented bikes at Villa Borghese, a giant hilltop park with manicured gardens, a lake, and sculptures and temples scattered in the greens. Another day, we explored the Borghese Gallery, a palace-turned-museum in the park that brims with enthralling Italian masterpieces. We explored the crooked streets of Trestavere, where we ate pizza next to multigenerational Italian families out for Sunday dinner. We shopped, bolstered by gelato. We tipped a street violinist wearing kelly-green suede loafers, proving that Italians of any economic means know how to dress. And every day, we passed by Santa Maria del Popolo on our way back home. Twice, I tried the church door and found it locked. Just as often, I creaked the door open to find a service underway, the priest's singsong lulling a handful of parishioners. On my last full day in Rome, I checked the church schedule, eager to study the artwork tucked into its side chapels. Santa Maria would be open until 7 p.m. At 6:45, I arrived, heard a sermon underway, and slipped into a back pew to wait. Communion came, and I witnessed a parade of takers: a tattooed hipster, a dusty workman, a woman in fur accompanied by a dog. When the service was over, it was clear I had missed my chance. The caretaker gently shooed out the parishioners, I with them. I had caught only glimpses of the Berninis and the Caravaggios after I rose from my pew. But Santa Maria is a working church for Romans — one whose artistic treasures are, literally, an aside — not a museum for tourists. In that way, it is much like Rome itself. Outside the church, I heard the door lock behind me. I turned and walked through Porta del Popolo, and the wonders of Rome, one last time.